Kyra Kyrklund is a fixture in the world of Grand Prix Dressage and for over twenty years she’s been consistently ranked amongst the world’s top dressage riders. Kyrklund has competed in six European Championships, Two World Equestrian Games and is a five-time Olympian. Most recently in 2008, Kyrklund placed fifth in the Individual Dressage Final Grand Prix Freestyle aboard “Max” in Hong Kong. A popular coach, speaker, clinician and trainer, she has recently taken on the mantel of Adjunct Professor of Equitation at Sweden’s University of Agriculture and Sciences. She is also the author of Dressage With Kyra. She stresses the importance of two-way communication between horse and rider. Kyrklund also emphasizes the use of the lightest aids possible. Riding for her native Finland, she considers her best performances to be her silver medal in the 1990 World Equestrian Games in Stockholm, Sweden and then her first place in the final at the World Cup, Paris, in 1991, aboard “Matador”. Kyra Kyrklund’s motto is “better late than never”, which is fantastic for me as I am quite late in getting out this wonderful interview! 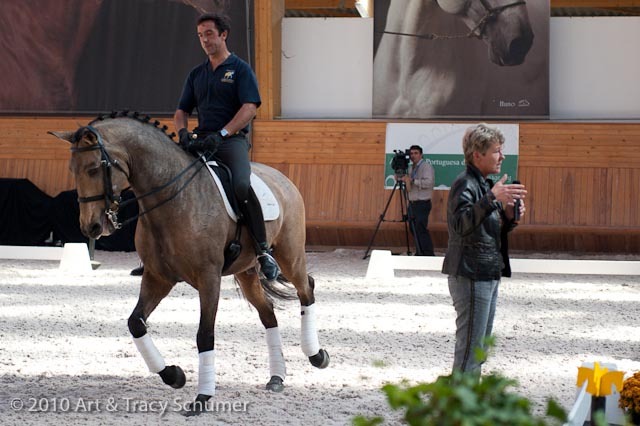 I had the opportunity to sit down with Kyra Kyrklund during the International Dressage Conference in Portugal last Fall. She was the lead speaker and presenter at the conference which showcased the Lusitano breed and focused on the theme; “Horses Show Exactly As They Are Ridden”. HMH: Do you see much in the way of classical dressage demonstrated in modern competition? Kyrklund: A lot of people have highjacked classical riding, by this I mean the word classical riding. In the old times, classical riding was the basis for all dressage. One has to look at the history, where did it evolve from, well, it came from the army. A horse had to be safe so that a solder could ride out into battle. The horse had to know gymnastics so that he could take the strain, to keep him from going lame. Keeping that in mind, they were also competing against each other. HMH: When I watch riders today, it seems so often they are working to hide what is wrong more than showing what is right. Kyrklund: In competition you hide your problems, well, it’s not really like this. I think all horses have their weaknesses and all horses have highlights. So if you only focus on the weaknesses then the poor horse is going to suffer under it. I think it’s more the acceptance that say, my horse has a bit more difficulty with half-passes and I will be happy with a seven instead of going for a ten. Maybe the judges write on the paper more for bigger steps or for more fluency or whatever, but I as the rider, know the capacity of my horse. So I have to say no this is my limit. I’m not going to try to do more because if I try to do more then I’m going to ruin a lot of other things that are good. It’s more the attitude as to what is competition and what is training. HMH: So what would you like to see in competition? Kyrklund: You try to make the horse better and better all the time and some things are getting better just through time. When you don’t need to learn new things anymore, you become more relaxed with the movements and then you get a better note. So I don’t think its like anything negative but I think there are people who are better at schooling when the horse is at home, they enjoy that, and maybe they are not prepared to accept limitations in some places, pretending that its Ok when it’s not Ok.
HMH: With the demand for high level horses these days, do you feel that shortcuts are being taken in the training of dressage horses? HMH: So do you see any difference now that the requirement is for a minimum age of eight-years-old for international Grand Prix? Kyrklund: That’s why I like and use this horizontal training more. I might take him out for a competition just to see how they take the whole environment, or by doing lecture demos like this to see how they take the environment; how do they take the flowers and everything. But I think in a way it’s good that they have competitions for four-year-olds and five-year-olds and six-year-olds and seven-year-olds but that should only be a tool to get to one place in order to educate the horse; not an end on itself. I think that is the place where you are ruining the horses- trying to pressurize them. To do more extensions than they maybe have in them. HMH: What would you change? If you were able to change some of the rules and restructure some things, what would you change? Kyrklund: I don’t think that one can really change anything because somewhere, ‘the young horse world championships’, it lives it’s own life. I don’t think that is really the place where you find a Grand Prix horse because what they are looking for there is not really what you need in a Grand Prix horse. What you need there is very regular paces, big paces, which many times are very difficult to influence actually; you can’t get it shorter, you can’t get it faster. So for more collection it will be more difficult. Then you have the whole environment there, it’s really difficult for a young horse- the people, the flags, so you have to have a horse that doesn’t mind what’s happening. And that is not either what we want in a Grand Prix horse. But it is, on its own, a window for the breeders to sell their horses. HMH: So this is why its so incredibly difficult to find a top level Grand Prix horse? A horse that can compete on the Olympic level, yet not be to excitable but also has the life in him to be at that level- the balances are so incredible aren’t they? Kyrklund: Yes, it is a remarkable challenge but even if you get on, let’s say, a four-year-old, even if it can’t do Piaf or Passage or things like that. It’s more like you…when you have been riding Grand Prix, educating Grand Prix, you feel how the horse is reacting to things. And that’s what tells you more, you can feel in the trot of a four-year-old if it’s going to learn Passage, you can feel if it’s easy for them and the reaction; if they are getting afraid and are they putting the hind legs back and running away or are they sitting up and collecting the body on their own. You can never be sure but it can give you indications. HMH: So what is unique about the Lusitano that makes it so special at this level? Kyrklund: They’re energetic and that is something that is good. I like a forward going horse, and I like a sensible horse. But still what I like, what I see, is that they can still be very good for an amateur. They are a bit like, you can pop them up and then you can leave them and they can calm down but then you can get on and they are going again. It’s like you can switch them on and off easily. The warmblood breeders are breeding more for the Iberian horses and the Iberian breeders are breeding more for the warmblood so you have the mix. But you also have the look of the Iberian horses and then you have to be honest and admit that the Iberian horses do not walk well enough. You lose too much points on the walk and you can’t really do a lot with that. But then some warmbloods have too big a walk, it’s too slow and thats not good either. So it’s the mix there all the time. Some of them, not all the time, they want to run a little bit in their extensions and canter and trot, so the Iberian horse, they have to be really good at Piaf and Passage. HMH: What would you say to amateur riders who are coming up? So many become enthralled with a particular type of overall ‘look’, but they don’t think about the path; about how much work it really takes to get to that correctly, to reach that ideal in the classical frame rather than an artificial one. Kyrklund: I think that every horse has its place in the world, whether they are dressage horses or jumpers or riding school horses, a driving horse or whatever. If you want to ride Grand Prix then you have to get a suitable horse for Grand Prix, or if you want to ride St. George then you need a horse for St. George. If you are an amateur rider, you need something that is safe but still energetic enough. In that way many of the Lusitanos are quite good because they are easy to sit and they are quite easy on the bit; they can teach the rider quite easily what is a good feel. It’s the feeling, it’s very difficult to teach because feeling is a sense like smell or sight, you have to smell something or taste something before you know what it is- it’s the same with the feel. If you can sit on a horse that carries the rider and it’s easy to influence. Some warmbloods are to heavy to influence, the rider ends up using too much power and then they can’t feel. So once you have that feeling then you say, ’that’s the feeling I want’, then you can also get it on a lazier horse or a bigger horse or whatever so the feel is actually one big part called rider’s education. If they don’t know what they are looking for and feeling then they don’t know where they go. It’s like I say, when you have eaten strawberries and then you have a cake with strawberries, you know it because you have had this experience. But if you have never tasted it then I can tell you for years that they are red and there are small stones and it’s sweet but also a bit sour and on and on. You are still no more near to how it tastes. As a teacher I try to get the rider to have the feel that I want them to have- then they will know for sure. HMH: Wow, fantastic, you have certainly given us a lot to think about. Thank you so much for taking the time to chat with us today. Kyrklund: it was my pleasure, you’re very welcome.